This text will help the reader familiarise himself with the basic notion of the labyrinth, its history and modern function. It is not my intention to enter the symbolics of the labyrinth as it is known nowadays (or better say unknown), nor it is my intention to explain different theories concerning the matter. Readers who are interested can use the Internet, while to the ones who desire more complete and more in-depth information, I recommend two books: “Through the Labyrinth”, by Hermann Kern, Prestel, Munich-London-New York, 2000., and “The Genesis and Geometry of the Labyrinth”, by Patrick Conty, Inner Traditions, Rochester, Vermont, 2002. Regardless of all interpretations about the nature and purpose of labyrinths, I presented my complete and thorough knowledge about the nine basic labyrinths in the second part of the book. As the reader shall see, this knowledge is unique and special. It does not rely on existing interpretations that, despite the number of books written, concur only in the claim that the origin, function and purpose of labyrinths are unknown or unclear, to say the least. By all indications, the word labyrinth originates in the pre-Greek languages, especially the forgotten and lost language of the people of Crete. The Greeks heard and accepted the term labris that referred to a „double axe“, a common Cretan symbol. However, there are different indications (Gimbutas) that point to the fact that the double axe symbol actually represents butterfly wings indicating an evolutional transformation, which is actually in concordance with the labyrinth symbolics. Labris is therefore a symbol, while the Greek ending inthos points to its location. When saying labirint(os), the ancient Greeks were probably referring to the palace in Knosos, marking it as the location of the “butterfly wings symbol”. However, no matter the complexity of Knossos, there have never been found any traces of a structure that would resemble a labyrinth, that is, the one that made famous the labyrinth of Crete – a drawing on Cretan coins. The myth of Minotaur, a half-person, half-bull who lived in the centre of the labyrinth, where virgins were sacrificed, also encouraged the imagination of explorers who were convinced that labyrinths as structures existed. Some claim it disappeared in one of numerous earthquakes, while the mythical story about a horrible monster in the very centre of the complex structure exists even nowadays, which strongly links it to the notion of the labyrinth. 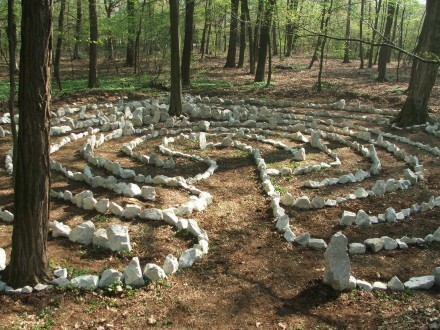 Consequently, an average person has a negative attitude towards the term labyrinth. 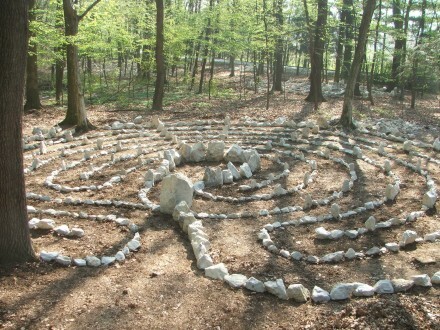 The most frequent association perceives the labyrinth as a “dark, hidden place; a place where you can easily get lost and hurt”. In fact, the primary culprit for the collective impression about the labyrinth could be the Greek philosopher Plato. He was the first one to use that term conveying one of Socrates’ dialogues (Euthydemus). Following logical arguments, the philosophers thought they had solved the problem and had come to a closure, when suddenly “as if they had fallen into a labyrinth” they found themselves at the beginning of the discussion! Therefore, a labyrinth is something confusing, but it does not end in a monster’s insides. It ends at the beginning, the place you started from. 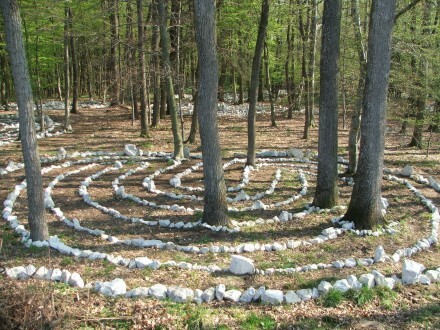 The term labyrinth was, in a way, used as an analogy for something confusing, something unclear and unknown, and something that brings us back to the beginning instead of leading is to a different place. 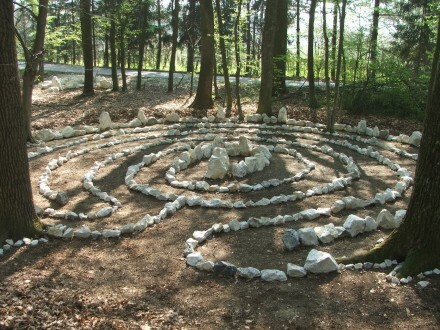 Nonetheless, the most common mistake that we need to rectify is the attitude that the labyrinth is a place with many options, with a path that suddenly ends in dead-end alleys or that it is a structure where it is difficult to find your way out. Unfortunately, Croatian language uses the same word to describe a structure that you do get easily lost in and, also, to describe a real labyrinth. In English, this is not the case. 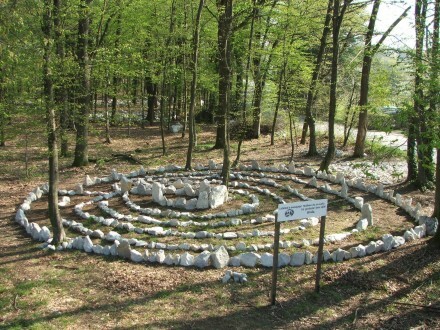 English has the word maze that we could translate as ‘zagubilište’ into Croatian, while it also has the word labyrinth, that, of course, means – labyrinth (labirint). To make this difference clear, let us try and determine what exactly a labyrinth is. If you think about these elements, you will quickly notice the fact that it is impossible to get lost in a labyrinth! 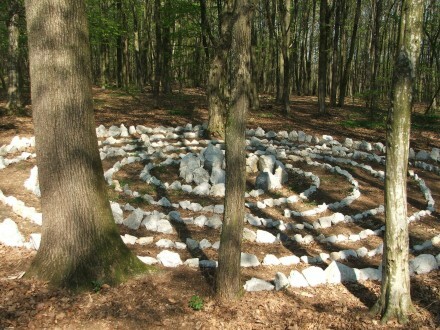 The only thing that a person walking inside a labyrinth must do is just that – to walk! Unless you turn around and head back, you will reach the centre. There you turn around and go back the same way that you came from. Let us go back for a moment to the ancient Greeks and their perception of the labyrinth. The myth about Minotaur in the centre of a structure called the labyrinth, the legend about Ariadne, who gave Theseus a ball of wool when he entered the labyrinth (so that he would safely return), and eventually the fact that the constructor of the labyrinth, the wise Daedal and his son Icarus were trapped inside of it, creates a completely different image in our minds from the one that labyrinths probably have in their original meaning. Still, the Greeks were confused by the labyrinth, which probably made them identify it with many things, to them unknown or unacceptable, that they had noticed inside a much older and different culture of Crete. In this regard, there are contradictory reports about the origin of the labyrinth. In his Iliad, Homer described Achilles’ shield which had a labyrinth drawn into it. Yet, he claims that this was the pattern of a dance floor made for Ariadne. There are other indications that the labyrinth was never a structure, especially not a dark and dangerous one, but that it was a dance pattern. It was that complex that Cretans would sometimes draw it into the ground to make it easier on the dancers. However, no such dance podium has been found in Knossos, making the coin with labyrinths drawn into it on both sides, the only connection between Crete and the labyrinth, aside from the very word that became universal. This kind of a labyrinth form is called classical or Cretan labyrinth, and it is one of the most famous labyrinths to have ever appeared in human history. Before we make a short overview on how labyrinths appear in all parts of the world, it would be a good thing to say that one of the Cretan scripts, the so called Linear B, has been partially deciphered. One of the charts mentions the Labyrinth’s Mistress or the Labyrinth’s Lover, who receives “as much honey as all the gods receive together”. This short remark points to the fact that for the old Cretans the labyrinth had a spiritual or even religious meaning. It is obvious that, even though it was a dance pattern, it still possessed a deeper, nearly sacred meaning. Although some claim that the idea and the notion of the labyrinth are ‘only’ four to five thousand years old, it is more likely that it has been following humankind much longer than that. However, as things usually happen, the further we go into the past, the evidence is more unclear, and interpretations can take on different forms. For instance, the Neolithic origin of labyrinths is not questionable. Namely, the Neolithic was a time full of secrets. It was a time when astronomy and astrology developed, together with the measurement of time and cosmic rhythms. Furthermore, it is in the Neolithic when people start to understand life and death, have ideas regarding reincarnation, and it is when other spiritual and even technical knowledge starts (megaliths, building astronomical observatories and similar). It is questionable whether the labyrinth as a structure existed even earlier on, in the Palaeolithic, more than twelve thousand years ago. For some, the answer is negative (because, how they say, structures so regular, were not interesting to the mostly nomadic population of that time). For others the answer is positive. Namely, even though there is no material evidence, labyrinths were never only structures (or some other material object as megaliths, stone blocks or sculptures). It is an abstract idea, a pattern that exists in the consciousness and expresses itself through movement and dance. It is not necessary for it to find a way to concrete existence in the material world. In the end, next to all myths and legends, the famous labyrinth of Knossos has never been found, although, as an idea, it spread across the world and sustained blows throughout centuries! Therefore, it is logical to assume that even pre Neolithic people knew the general cosmic laws, at least in their rudimentary form. Forms similar to labyrinths have been found in most of old culture on all continents: Celtic, Mayan Greek, Cretan, American-Indian, and Indian… Of course, the interpretation as to the universality of the appearance of labyrinths is different. While some claim that the original labyrinth is the Cretan one, and has found different ways to spread across the world, others claim that this is actually a universal pattern that was created in different cultures of the world that were mutually independent. If it is true it was created in a single place, its most probable point of birth is the Mediterranean circle and the culture of Old Europe. However, if this is true and this is the place from which the labyrinths spread across the world, it does not mean that the idea could not have existed, in this or some other form, in other Neolithic cultures of that era. 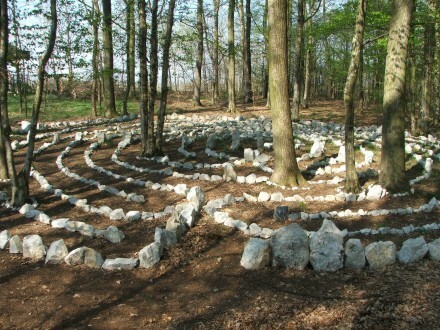 Regardless of the use of the word labyrinth, similar structures are mentioned in the oldest oral and written tradition. Thus, Mahabharata, the oldest Indian epic, mentions a deadly military formation much like a labyrinth, which was used in the battle field of Kurukshetra. In Ramayana, the second most famous Indian epic poem, a labyrinth is an unconquerable fort of the demon Ravana who had kidnapped Sita, Rama’s wife. Tantric art knows yantras and mandals that are much like labyrinths. There is a labyrinth in Egypt, next to lake Moeris, for which they claim is some kind of matrix that reflects the structure of the universe. There is a labyrinth in Korea called the seal of the ocean. A text inscribed into it, according to the legend, explains everything that exists in this world. Tihuanaco calendar talks about a time structure that resembles a labyrinth. If we start from the Cretan towards our own time, we will find labyrinths in Celtic and Scandinavian motifs. Also, the ancient Hopi tribe from Northern America knew the labyrinth as the “house of the Sun“, and the Pima tribe as the house of Siuhii, a mythical hero whose tracks were so confusing no one could ever find him. In India, in the Halebin temple in Mysore, there is a painting of a structure that resembles a labyrinth. It represents a self or consciousness that is a source of images we use to “create” our world. It actually illustrates a deadly formation that the sage Drona had described in Mahabharata much earlier. In the west, the labyrinth is preserved in roman mosaics, while it was later integrated into the medieval architecture. Strangely enough, Christianity accepted it tacitly, so it became a type of substitute for pilgrimages. 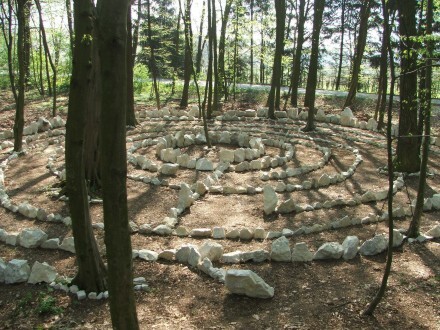 Not being able to go to a holy place (Jerusalem), pilgrims walked through a labyrinth. In this way, without them even realising, they preserved the ritual function of the labyrinth as the arrival to aholy place – the inner centre of consciousness. The oldest existing Christian labyrinth is the one in the basilica Reparatus in the town of Algera in Spain, dating from the forth century A.D.
One of the extenuating circumstances in accepting the Cretan labyrinth type was probably the fact it had a cross in its centre, meaning that its seed pattern can be presented in form of a cross. Later, labyrinths blossomed across European churches, especially in France. The most famous Christian labyrinth is most definitely the one in the cathedral in Chartres whose circular design became very popular as a symbol of Christian labyrinths. Next to Chartres, there are also churches in Sens, Poitiers, Bayeaux, Amiens an Rheims, and cathedrals in Rome. 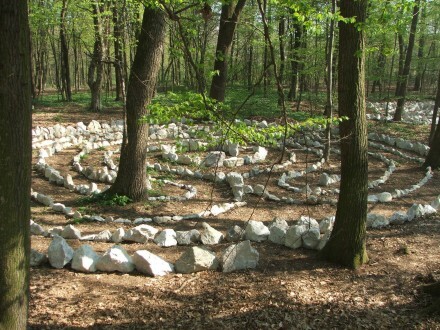 Nowadays, labyrinths do not only appear in churches and sacred places, but also in parks, public areas and private yards. They have been accepted as ornaments and works of art, so no one is concerned by the fact that we know so little about this structure. It is likely that the secret of labyrinths will not be solved any time soon. Despite its universality and acceptance in all cultures, there is not much we know about it. It has remained faithful to its symbolics – and to this day confuses us with its forms, curves, paths, centre… And then again, it looks like it has been more present now than ever! Thousands and thousands of people have heard about the labyrinth, walk around it and no matter they have no knowledge about it, they enjoy the delicate presentiment of power and unclear feeling of mysteriousness that its presence brings with it. From the book Labirinti i njihove tajne (Labyrinths and their secrets) by Adrian Predrag Kezele, 2007.